Over the years, Porchlight Music Theatre has staged more than 70 productions, including many Chicago and world premieres, and has been honored to receive an impressive 42 Jeff Awards and 151 Jeff Award nominations, 28 Black Theatre Alliance nominations and 12 awards, among other recognition. We are especially proud to have received five consecutive Best Production Jeff Awards for A Class Act (2013), Ain’t Misbehavin’ (2014), Sondheim on Sondheim (2015), Dreamgirls (2016) and The Scottsboro Boys (2017). Our New Faces Sing Broadway revue series is presented one night in Chicago and one night at the Skokie Theatre. This series presents the ‘hits and misses’ of a given year on Broadway, emceed by a local theatre luminary, and showcasing 10 up-and-coming local music theatre stars. 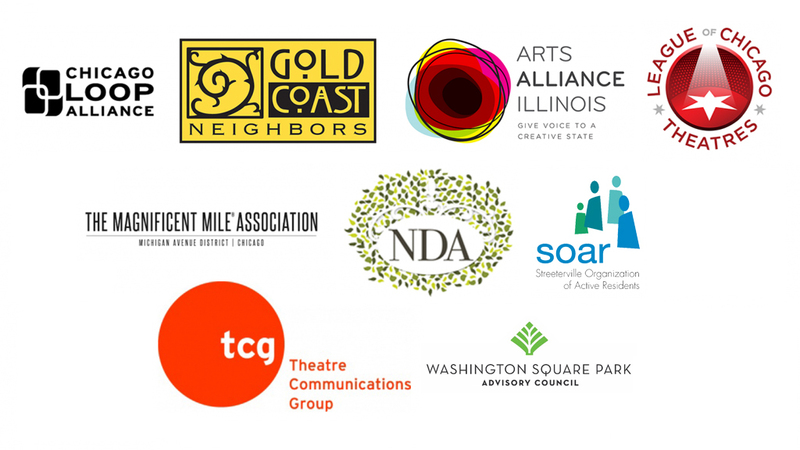 You can enjoy Porchlight Music Theatre artists at our two annual special events – the signature ICONS Gala brunch held each spring and our always-anticipated Chicago Sings concert each August. Our commitment to the music theatre genre includes celebrating not only the past and present state of the art form, but also in nurturing its future. The School at Porchlight, now in its fourth year, offers children and professional artists an opportunity to pursue training in performance (singing, dancing, acting) and writing, offers enthusiasts unique appreciation and scholarship events, and connects area youth with the art form through our “Make Your Own Musical” summer camps and school-year programming from the area’s top teaching artists. We continue our forward-thinking commitment with our Off The Porch program of new musicals where we nurture new works in various stages of development. Recent projects we’ve helped move along include Bran Castle, Everly Yours, Emptynesterhood and The Gatecrashers. We welcome you to explore our site, get connected and become more involved with the Porchlight Music Theatre community; where artists, supporters, audiences and friends shine the light on passionate, innovative and relevant works that celebrate the past, present, and future of music theatre. We look forward to seeing you at the show! A nationally recognized cultural institution in Chicago, Porchlight brings people together to explore the human experience through the art of music theatre fostering community, inclusion and empathy. Porchlight, Chicago’s home for music theatre, illuminates the past, present and future of this American art form through live performance, youth education and outreach programs that positively impact and connect us to the community. We believe that all voices and life experiences are essential to portraying on stage a complete picture of the human experience. We are firmly committed to the music theatre genre presented in an intimate experience. We treat artists, staff, volunteers and audiences with respect and dignity, inviting all into our artistic home. We strive to be inclusive with representation in all aspects of our organization. We invest in the future of music theatre through nurturing and mentoring the next generation of artists and audiences. We ensure long-term organizational stability through prudent collaborations, strategic alliances and sound fiscal planning. Porchlight embraces the diversity of our community and strives to be an inclusive organization, artistically and administratively. Throughout all aspects of our work, we welcome and support diversity, encompassing, but not limited to, age, gender, ethnicity, race, disability, religion, sexual orientation and economic status. This is key to our success as the home for music theatre in Chicago. Porchlight Music Theatre was incorporated in 1995 by founding Artistic Director Jill Moore and a close group of artists and friends who aimed to create a company that would feel like home to artists and audiences alike. Porchlight came to symbolize creativity, comfort and community and for more than 20 years the company has kept that light shining brightly. Under L. Walter Stearns’ artistic leadership from 1998-2010, the company took on more ambitious works and added its first Equity contracts in 2004. Porchlight’s wildly successful production of Ragtime during their 2006-2007 season was a turning point for the theatre when it enjoyed an extended run at Chicago’s Apollo Theater. In 2010, veteran actor/director/artistic director Michael Weber took the artistic helm at Porchlight and the company continues to wow audiences with first-class, sophisticated and engaging music theatre, performed by the finest veteran and emerging actors, dancers and singers, with inventive direction, and arresting design innovations. The 2016-2017 season for Porchlight was yet another key turning point in the company’s evolution. In the Heights, the season opener, attracted record attendance, critical acclaim and four extensions for an all-time high of 78 performances. This hit musical changed the face of the company and provided the capacity and economic stability for Porchlight to make the big move to their new performance venue, The Ruth Page Center for the Arts, in Chicago’s Gold Coast. Putting it Together / A Catered Affair (Chicago Premiere) / tick, tick…BOOM!